A few days ago I was speaking to one of my users about creating some PDF files from Microsoft Word and securing them so that they can’t be copied or printed. Rather than using expensive software from Adobe or a generic creator like CutePDF I recommended using the add-in for Word 2007 that Microsoft provide as it provides some useful accessibility options (thanks to JISC TechDis for highlighting that one to me). Unfortunately the add-in doesn’t have an option to secure a PDF so that’s where using a tool like PDFTK can help. Being a command line tool though and the user having to produce more than 100 PDFs meant that a little help could come in handy. Making use of the select folder VBScript I refined a little while ago, I created a generic VBScript to take a folder selection from a user and a command line operation via a simply single line input box to then process every file in the folder using the command line. A percentage symbol is used as a place holder for the file path to be substituted into and any file paths for the command line (with the exception of the substitution – %) should include double quotes where there are spaces in the path. 'Identify each file in a folder and run the specified command against it. , vbOKOnly & vbExclamation, "Invalid Selection"
As it stands the folder just processes a single folder for all files (which was what I wanted), but simple amendments could allow this script to cater for specific file types (or patterns) and sub folders (a recursive call in the ProcessFolder() routine would allow this). A little while ago I spent some time outside of work struggling with a particular application on my Samsung Omnia i900 mobile phone. It seemed like it just didn’t work properly and I almost reported it to the developers as a bug. Just before I did I came across another piece of mobile software and noted a very similar problem and this time something clicked and I realised what the issue really was. The problem I was experiencing was that I could navigate within the applications using my physical pointer on the touch screen of the phone, but within some parts of the application there was just no response when tapping (or double tapping). Using the inbuilt optical mouse button had an identical non-response. Eventually I realised that the software had been written for Windows mobile devices that had a physical D-pad. A D-pad (or directional pad) is typically found below the screen on a Windows mobile device and has five physical buttons. One for return (usually in the centre) and four directional buttons (up, down, left and right). Since the Omnia has no D-pad my next thought was to have a look through the inbuilt keyboard options for an on screen keyboard with directional buttons. By default I use the “Samsung Keyboard” which does not have any directional buttons. A quick search through the options showed that the “MS Keyboard” was the only one to have arrow keys. I tried using this keyboard and it did indeed resolve the navigation issue in the applications. the only problem is that whilst I could navigate using the physical pointer and the optical mouse with this keyboard it is slow and fiddly as the keys are simply so small. I use my fingers to do most of my interaction with my phone so I decided to continue looking for another finger friendly solution. My first investigation was in trying to find a “virtual” or “on screen” D-pad. Unfortunately everyone’s favourite font of all knowledge (Google) didn’t yield any usable results and so I took a step back to see if there were any keyboards for Windows mobile that could be configured to have large directional keys. This time my search was a little more fruitful. PCM Keyboard is an incredibly flexible keyboard for Windows Mobile devices. Using the Microsoft emulator for WM6, a base theme package for PCM Keyboard called “dream2“, some rough documentation and several hours of confusion and frustration later and I have managed to configure more than just a simple on screen D-pad. My solution is “DPress” a theme for PCM Keyboard. Copy the DPress.zip file to your Windows mobile device and place it into the same directory as your PCM Keyboard installation (check under Program Files on whichever storage area you installed PCM Keyboard to). Select the options for installed keyboards and the options for the PCM Keyboard. Select DPress and ensure that you select a keyboard type (qwerty and azerty are included). Save the changes and then the likelihood is you’ll need to restart your device and reselect the PCM Keyboard as the input option to get the DPress keyboard. 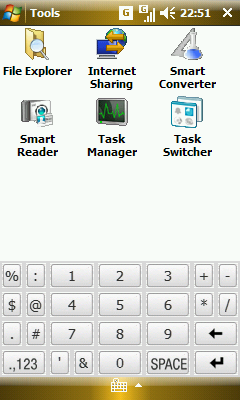 Below are some screen shots on how to access the different displays of the keyboard. Click on the thumbnail images for larger views. The lower case keyboard left is the default keyboard view as one might expect. From here the keyboard layout can be changed through a number of key presses. The most obvious one is pressing the shift key. This will change the layout to upper case(shown on the right). Pressing and holding the shift button will enable what is in effect caps lock and the upper case layout will remain until the layout is again changed – e.g. by pressing shift once more. A number of keys provide quick access to in-situ additional keys. Pressing and holding vowel keys will give access to extended character sets, similarly pressing and holding space will give access to numbers, the comma button will allow access to emoticons and the return button will give access to some function buttons (options, cut, copy, paste). Some of these are illustrated in the following screen shots. Clicking the “.,123” button swaps to a numeric keypad (left image below). Clicking and holding the period (“.”) button swaps to a symbolic keypad (middle image below). Finally (and the one you’ve probably been waiting for) by clicking and holding the “.,123” button a D-pad is displayed (right image below). Quite versatile for one keyboard theme on a mobile device? I think so. I’ll be blogging about the pieces of software I had the issues with in the not too distant future, but in the meantime enjoy the DPress keyboard. It is provided as is with no guarantees and I’m sure it probably won’t display well on every Windows Mobile device, but if it doesn’t work why not modify it yourself and modify it to suit your purposes. That’s exactly what I did with the “Dream2” theme so ultimately my thanks go to the author of that theme and PCM Keyboard.